There were no frills when it came to naming the premiere episode of Sleepy Hollow, as the series pilot thrust us right into the heart of a story we thought we knew... but our expectations quickly needed adjusting because there was little about this program that harkened back to the fairy tale we thought so familiar. In this version of Sleepy Hollow, nobody had heard of the fairy tale and Ichabod Crane wasn't a mousy school teacher. He was a professor at Oxford who had come to America to fight on behalf of the British army, but fell in love with the idea of what America represented and decided to switch sides. He became a valuable ally to George Washington himself and was on a special mission at his bequest to take out the fellow who became the headless horseman. Not just an ordinary fellow, he was death himself! From the moment Ichabod awakens in a cave surrounded by what appear to be voodoo-like elements and stumbles onto a paved road with cars whizzing by, you know this isn't your parents' Ichabod Crane. 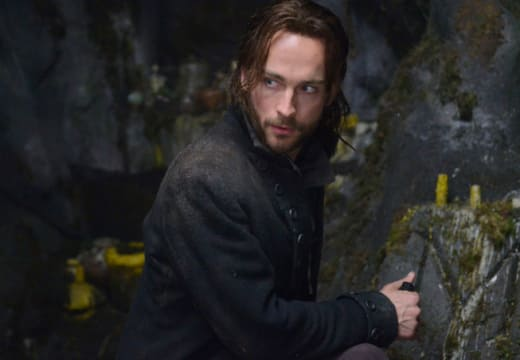 For one, Tom Mison isn't hard on the eyes. Additionally, while he's definitely surprised at his surroundings, he seems to take it in all in stride, as if his past has been just crazy enough that he can believe something strange has happened and he'll patiently wait to discover his fate. The casting of Mison was equally matched in that of Nicole Beharie as Abbie Mills, a deputy on her way out Sleepy Hollow and on her way to the FBI Academy - until she sees her friend and sheriff beheaded by a headless horseman. She, too, has a past that allows her to easily accept the unimaginable without pushing her too far off course. The chemistry between Crane and Abbie was immediate and their banter believable. I don't think just any man could have had the discussion with Abbie about the emancipation of the slaves and gotten away with it, but Abbie instinctively trusted his sincerity and it strengthened their bond from the onset. I also really enjoyed that the other characters suspended their disbelief of a man popping back up in the 21st century with barely giving it a second thought. Once Crane passed the lie detector test, the brass instinctively wanted to send him to the loony bin, but they also welcomed him to the present by telling him he won the war and showing him a dollar bill. There was a part of them fighting the idea that he was crazy, too. It only took another beheading and the discovery of the blinking, canned skull for all skepticism to slip away and for them to partner Abbie and Crane to look into whatever the hell was happening in their once peaceful town. The addition of Crane's wife, Katrina, being caught in some middle world of magic, fighting on her husband's behalf and leading the way for he and Abbie to discover clues she left behind as the mystery continues (while she also hopes for her own salvation) takes away any worry on our part of a romantic entanglement between Crane and Abbie. They make great friends and allies; it's nice to know we won't have that undercurrent ruining every episode as we move deeper into the mystery of the apocalypse. Oh! I failed to mention that, didn't I? Okay, maybe I just haven't gotten to that new development in our modern day Sleepy Hollow saga. Our headless horseman (who looked a lot like Bane from The Dark Knight Rises before his head was lopped off) is one of the four horseman of the apocalypse. No matter what happens to this one, there will be three more, and they won't just be chasing Ichabod Crane around, but hoping to bring down humanity and end the world. How's that for a neat twist on the old tale? Top it off with a bit from Revelation that suggests Crane and Abbie are the two witnesses who were brought together for a seven-year period of tribulation to fight the forces of hell. Their battle is supposed to ordain the fate of the world on Judgment Day. The good news is that they must have a plan to keep the show on the air for seven seasons (c'mon ratings!) and a nice outline to get there. There were plenty of scares, a healthy helping of humor and fictionalized historical references to play with making the story feel more compelling. For me, it was a solid win. The casting, writing and set design are all above par. Taking a chance by killing off some of the more familiar faces in the first episode (Harold goes to hell!) always impresses me. It means that pretty much anything can go and we need to hold on to our seats because it's going to be a rough ride. Bring it on! The Rolling Stones Sympathy for the Devil is a perfect accompaniment for Sleepy Hollow. I enjoyed Ichabod's questions about Starbucks and wondering whether there was a law requiring so many of them. Of course, he wouldn't have been able to look at at a city street and said, "that used to be a livery stable," because things would have been unrecognizable to him. Did you catch the irony of the street sign that was cut in half during the sword fight in the cemetery being one that showed horse crossing? It ended up as a headless horseman. Since the first horseman to visit was death himself, we can assume the other three will be war, famine and conquest. I wonder what will make them different opponents from death and whether they, too, will be headless. If Brooks was right, war is next up.